The decision of choosing just the right fishing tackle differs from angler to angler. Often a novice angler can decide which the right tackle is for her/him only after gaining some knowledge and experience. To start with you should largely rely on dealers, other experienced anglers and online guides. The best thing to do is to go easy while buying your first major fishing items like reel and rod. You need not buy very expensive tackle; rather it is advisable to purchase cheap fishing tackle to start with, though you should check quality, as poor quality can negatively affect your success and confidence. Once you get an experience and improve your skill level, you can upgrade. After sales service is a major factor to consider while choosing perfect fishing tackle. Therefore, approach a reputable dealer instead of a supermarket cheapie. You should check the quality of the tackle carefully because there are many risk factors like corrosion and general wear and tear, in addition to freshwater and seawater which are hostile environments. Plus there is always a risk of accidents. E.g. if your valuable reel and rod are dropped on a concrete road or stones, they will be surely broken. So, it is advisable to have some spare backups, especially reels. Main things to take into consideration while choosing a rod are the type of fish you want to catch, location of fishing (streams, rivers, sea, etc) and also the type of lure you will use. There is a difference in the length, weight and action of different rods. Length: The length should be chosen according to the type of fish and the location of fishing. For wooded areas and larger fish, shorter rods are best, while for open, clear spaces and smaller fish, longer rods are best. Weight: Based on weight or “power”, rods are classified as ultra-light, light, medium, medium-heavy, heavy and ultra-heavy. Ultra-light rods are best for baitfish, panfish and other small fish. 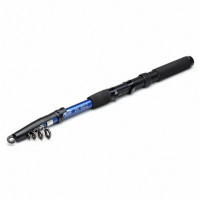 Ultra-heavy rods are best for surf fishing or for very heavy fish. Action: Action or whip refers to the speed with which the rod comes back to its original pose after bending. It ranges from slow to very fast, i.e. from whippy to stiff respectively. This also depends on the weight of fish, i.e. heavier fish need faster actions while smaller fish need slower action. FishingCheaper.com are a leading discount fishing gear supplier who strive for providing all the essentials you require without the retail prices so that you can have a good fishing day. Visit their website to take a look at their extensive range of products.